David reached out to CCS for a point of sale solution to replace their existing system. They had seen the youtube videos. They wanted a demo. After trying the online demo, they decided to move foward. David was using POSnation.com for a point of sale system. But it would not print out Chinese characters. it was also not easy for their staff to use. Additionally they needed a system to use Netepay with a Vx805 pin pad by Verifone. The staff does not read or speak English, so they needed something that would be use icons or Chinese characters for the staff to read. They wanted more than 'numbers' as the item identifier on an order. Another requirement was a quick switch over. They had existing equipment, including an Epson TM 220 printer, touch screen Dell computer with Windows 7. They wanted their system up in just a couple of days, to replace their existing one. Fortunately their manager knew point of sale, and the requirements for setup. With very little effort he got things up and running. Because CCS includes 3 hours training with their software purchases, the owner was able to get things up and running with exactly the price he was quoted for. No additional costs were required, no ongoing fees, no subscription plans. His system was 795.00 in total. If you would like to find out more about what CCS can do for you, please contact us for a demo! Located in Montana, is Hardin High School. This school creates equal opportunities for learning for all students and fosters an environment that nurtures, challenges and guides students. They believe that learning is a lifelong process in which students should think both creatively and critically. In late 2016, Hardin required a Point of Sale System for their concessions stand that’s used for various school events and activities. The agent selected on behalf of Hardin to find a POS, was the teacher of Business. After demoing a series of POS software from various providers, Hardin came to Cafe Cartel - who specializes in concessions POS. Let’s take a look at some of the reasons why Cafe Cartel’s solution proved superior to other alternatives. Hardin purchased the Altera 3800 Tablet with LCD customer display and barcode scanner. The embedded printer in the base of tablet, not only saves space but is a clean and modern design. With CCS reconciling feature, Hardin is able to create a time period that they wish to reconcile their inventory. After creating this period they can scan in items. They can choose to reconcile by department as well. After scanning in inventory, the count is updated and CCS creates a report that will show any discrepancies. This saved report is now a snapshot of their inventory. Another reason for the selection of CCS, was it’s user-friendly interface and intuitive processes. Items can be selected from menu buttons or by scanning in via the barcode scanner. 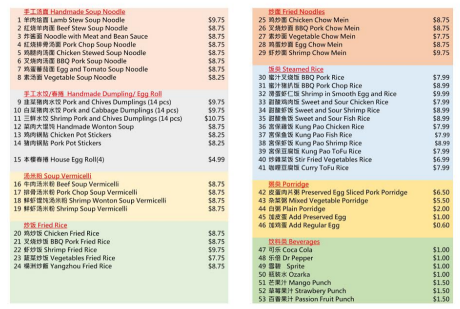 From the side of the menu layout is a column of categories. After selecting, let’s say, the category “drinks”, Hardin can then choose the type of drink and size if applicable. Inventory levels are updated in real time, which means cashier can see a current inventory count on the menu buttons. Reporting may also be viewed during their shift if they desire to monitor them periodically. However, once the balance sheet is completed and the shift is closed, the sales reports are automatically emailed out to supervisors. All CCS systems come with employee time clock, labor scheduling, reconciling, reporting, portion control and much more. Whether you're looking for a traditional POS or something more modern, Cafe Cartel offers solutions at every price point and will work with your goals to get the solution that bests suits you. Since 2004, CCS has installed thousands of Point of Sale System’s around the world. Whether you're a school, hospital, stadium, small business or large chain, CCS is committed to providing a solution that will help your business succeed. To review your priorities with an industry consultant, call 866-973-8099 or request a quote today. Dispensaries in Los Angeles using Point of Sale. 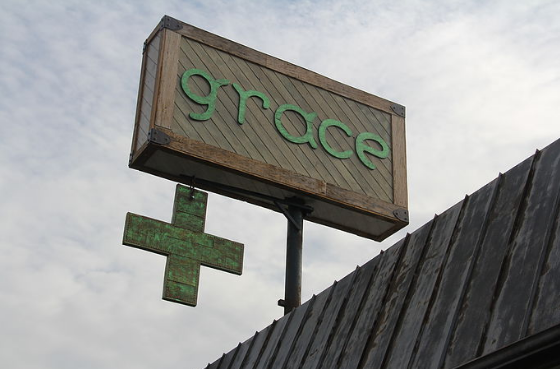 Located in Los Angeles, CA is Grace Medical Marijuana Pharmacy. This dispensary operates with both compassion and legal integrity; ensuring that qualified patients may purchase quality medication in both a safe and legal environment. Grace has three tiers of product to choose from. Like may locations, their lowest gram is $7 while their premium is $30. Their facility is spacious enough to handle a large influx of customers. With two patient check in stations, they can check in their patients quickly. Patients are able to browse their gift shop area and purchase those products before going to the budroom. Once in the budroom, they use scales for weighing fresh products in front of the patient. This way the patient knows exactly they’re getting what they see on the shelves. They stock only fresh product, so not all 60 strains are always available. As the strains age, they lower them in the price tier brackets. With so much inventory being moved daily, they needed something designed for the industry. For example, with each budtending station checking for inventory, a POS with inventory location tracking might be more effective. Considering the amount transactions being fulfilled, replenishing bud stations, counting cash and cash drawer deposits throughout the day - it soon became clear that they needed a solution that was both well designed and high level. Since they had retail in the front and budtending sales in a separate area, they needed a POS that could accommodate this setup. They required a system that could be flexible in pricing and discount procedures. Not to mention they wanted to implement a rewards program. And finally, they desired the ability to receive orders online, using an integration with an online store. By creating a list of their needs and desires, they were able to compare these things with various POS companies. When they found Cafe Cartel, they found a dispensary solution that could accommodate their needs for inventory location tracking, loyalty programs, intuitive pricing and discounting, as well as online website integration. Because of their high volume in the bud tending room, they ordered POSX tablet computers with embedded printers. This lowers the footprint of a system that also needed label printers and scales attached. With their attached label printers, they became able to barcode each item, including the jars so they can scan items. They also use buttons that may be selected as well. CCS software produces labels and barcode labels that they can affix to all of their items that vendors do not provide labels for. For their server station, they opted to purchase their own computer and purchase a CCS license for it. They also added an additional station in their gift shop/retail area. All of these changes harmonized their operations so they could function both smoothly and effectively. When they initially began looking for a new POS, other concerns became apparent which Cafe Cartel was easily able to accommodate. With 25,000 people in their system, patient check in and verification efficiency was essential. Previously they were using an Access Database for check in, however CCS was able to perform this with greater speed. By using a 2D barcode scanner, it reads the driver's license information and populates the patient info. It may also be used to look up people again. Their old system didn't do “google style” searching. So they previously had to find patients by full name. With CCS, when someone’s card isn’t readable, or they don’t have a traditional driver's license or identification, staff can quickly look up people with a partial name search. Looking for the right for Medical/Retail Dispensary or Collective? Since 2007, CCS has been providing POS systems to dispensaries in California - before eventually branching out to other states and Canada. This solution is designed specifically around the needs of the industry and is updated as regulations for operations continue to develop. This secure solution locks down from raids, prevents tampering and exposure to hackers. To review your dispensaries needs with an industry consultant, call 866-973-8099. Whats new in Self Serve frozen yogurt? What's new in Frozen Yogurt? Doing things better. 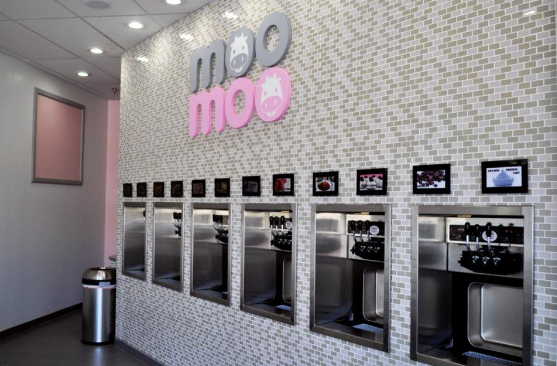 Located in McMurray, Pennsylvania is Cowtastic Frozen Yogurt. They offer 100% nonfat or low-fat and cholesterol-free frozen yogurt. Froyo shops are notably popular because of their considered health benefits, such as maintaining a healthy gut balance and boosting your immune system. Flavors may range from traditional tart, to espresso, mango, birthday cake and even pistachio. By continually rotating their flavor selection and by offering over 40 different types of toppings, Cowtastic is certainly a guilt-free alternative for those with a hankering for something sweet. As with traditional self serve frozen yogurt shops, Cowtastic’s customers first choose the size of their cup, froyo flavor, add the desired toppings and then take their creation to the cashier to be weighed. By utilizing the CCS POS system, the cashier selects the size and amount of the cups on the scale. Since the scale is integrated with the POS, the computer will read the weight from the scale and calculate the price. The cup’s weight is tared from the order so that the customer isn't being charged for the cups. 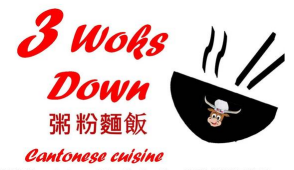 From the LCD customer display, the customer will be able to see the order’s detail, including their loyalty points earned and any specials Cowtastic wishes to have advertised. This All-in-One integrated solution, minimizes human error and prevents employee tampering to ensure that orders are charged and priced out correctly. Scales are also NTEP approved. Additionally, CCS also includes free loyalty and reward programs for their users. During an order, the cashier can easily assign the order to a customer by swiping their loyalty card or looking them up by phone number or email. CCS then tallies the loyalty points or “buy x, get x free” amounts. This is yet another example where the system proves more secure than, let’s say, a punch card method. Managers are also capable of remotely logging into the system while working off site or implementing a Blind Close function for the cashiers. Cafe Cartel Systems has been providing Point of Sale systems to the frozen yogurt industry since 2004. CCS systems come complete with labor scheduling, employee time clock, payroll, reporting, reconciling and much more. Additional integrations include, website integration, EMV/NFC payment methods, touch screen customer displays, barcode scanners, fingerprint readers and coin dispensers, to name a few. CCS has hardware solutions for every style and price point. Their technical support has helped install thousands of systems worldwide, from small shops to large froyo chains. To review your frozen yogurt shop’s needs with a consultant, call 866-973-8099 or request a quote today. Located in Chandler, Arizona is Orange Leaf Self Serve Frozen Yogurt. With a strong brand identity, this yogurt chain has created the hashtag #BEORANGE which represents being more than just a froyo goer. According to their website, being orange is about standing out and being original - to let your creativity shine through by indulging in your own froyo creation that is as unique as you. Considering this, it’s no surprise that they chose an orange unicorn to be their mascot. They also have be introducing cups with artwork of aspiring artists. If you’d like to see just how out-of-box the orange unicorn is, check out Orange Leaf’s website for his backstory. You’ll be sure to be entertained. Orange Leaf Chandler utilizes two POS systems with integrated scales and LCD customer displays. The scales are NTEP approved. Because they are integrated, the POS will calculate the price of the yogurt that is on the scale. But before the total is given to the customers, the cashier will select the cup sizes and their amount on the scale so that the POS tares the weight off and only charges customer for the actual weight of the yogurt. CCS uses an inventory tally to track inventory of toppings, fruit, wet and dry items. This is done to accommodate the fact that when selling by the ounce, you can not determine the amount of toppings and yogurt used in the sale. This method is the only inventory system for frozen yogurt. Frozen yogurt shops such as Orange Leaf are always coming us with creative ways to draw in more business for their shops. CCS organizes this both efficiently and securely. Some of the different discount methods that can be used in CCS are Item Percentage, Order Percentage, Quantity Off, Cash Off and Happy Hour Pricing. Tiered pricing may also be implemented to encourage people to invite their friends out for frozen yogurt. Essentially tiered pricing is giving customers a higher discount for the greater amount that they purchase. For example: Tier 1: 1oz. - 8oz. = 49 cents; Tier 2: 8.1 oz. - 16oz. = 47 cents; Tier 3: 16.1 oz. - 36 oz. = 43 cents. A Point of Sale System is the critical point where a business receives payment from the customers for goods. By having an advanced solution such as CCS will allow that moment to be the best experience for your customers. This can be done by touch displays, NFC/chip payments, loyalty programs (which dedicates the customer points earned for store credit) and much more. All systems include employee time clock, payroll, reporting and reconciling. Additional integrations such as barcode scanners, surveillance systems, QuickBooks integration and much more are available as well. To review these features with a consultant, call 866-973-8099 or request a quote today.